Effective communication is essential when working with the Chinese, but a lack of foreign language skills on both sides can impair progress. Enter Chinese idioms, steeped in Chinese culture, they can easily communicate complex ideas quickly and succinctly. Learning a few key idioms can do wonders for your ability to communicate in China, and increase your respect (face) among the Chinese as well. Working in Mainland China can be tough for Westerners, not simply because of the incredibly different culture and society, but also because almost everyone else speaks a different language. And while learning Chinese can increase one’s ability to engage with Chinese colleagues and add value within a Chinese organization, most Westerners and those born outside Chinese-speaking countries will always be at a disadvantage compared to native Chinese speakers. This can lead Westerners in Chinese organizations to feel left out of the loop, or looked down on for not being able to communicate effectively. Mainland China has long been an enclosed and isolated country. When combined with China’s long and illustrious culture, it can be hard for Mainland China natives to accept that non-Chinese are truly capable of understanding them, their culture or their language. This can amplify communication difficulties initially caused by language barriers, and make it much harder for Westerners to reach an understanding with their Chinese coworkers and partners. 争先恐后 (zhēng xiān kǒng hòu) is an expression that describes modern Chinese society after Deng Xiaoping’s economic reforms – everyone is “struggling to get ahead” because they are “afraid they will be left behind”. However, there is an easy solution based on my own experience working with the Chinese, specifically to learn and use Chinese idioms. Chinese idioms are linked to the very cultural history that the Chinese value so highly, and can help Westerners build bridges and communicate more effectively with the Chinese. In this article, I will introduce the concept of Chinese idioms and set phrases, including their background and significance to the Chinese, and how they can be used when communicating with the Chinese. For those interested in jumping straight in, a list of easy to use idioms I often use in business settings is provided at the end of this article. 打草惊蛇 (dǎ cǎo jīng shé) can be literally translated as “beating the grass and startling the snake.” It actually has nothing to do with snakes and instead refers to alerting your enemies to your plans through carelessness. Chinese idioms (often 4 characters) and set phrases (often 4-10 characters) are short sayings that contain a specific message or moral. They are often based on events or stories of historical significance, and are viewed as an important part of the Chinese language and culture. They possess the added bonus of delivering complex ideas in a quick and concise format. The one downside is that these phrases can not be ad–libbed. There is only one way to say a particular combination of characters (hence the term “set phrase”) and thus they must be memorized exactly. Knowledge of literary phrases and texts has been highly regarded in Mainland China for hundreds, if not thousands, of years. A prime example is the ancient imperial examination system, which began coming to prominence in the Tang dynasty (618–906 AD). During the Tang dynasty the Confucian classics were introduced as a core part of the higher level examinations, and candidates were expected to memorize sections and even entire texts word for word (or character for character) if they expected to have any chance of success. As a result, for hundreds of years Imperial China’s government bureaucracy was dominated by so-called scholar elites, who possessed an outstanding knowledge of Chinese literature and Confucian philosophies (e.g. not science or economics). And while modern China has now developed beyond this narrow definition of elite status, those in China with academic distinction, including that related to language and culture, continue be admired for their knowledge and accomplishments. 闭门造车 （bì mén zào chē） is used to refer to someone who “closes their door and builds a cart,” which means to attempt a task that one has no prior knowledge of while disregarding the advice of experts. 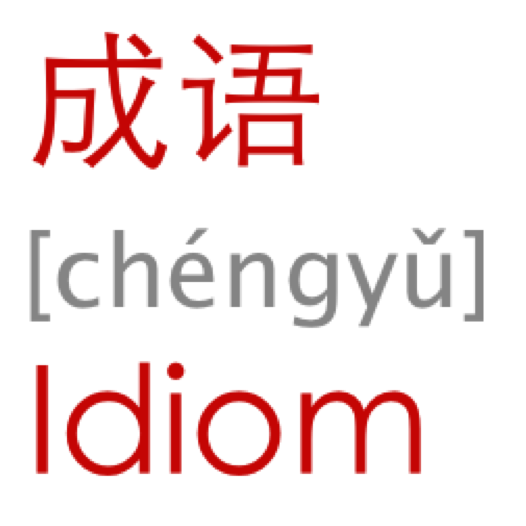 Idioms and set phrases are very common in modern China, and while they are more often found in books, articles and reports, they are common in spoken language as well. I have observed them to be used regularly by business leaders, academics, and others who desire to demonstrate their knowledge or refinement. Idioms and set phrases are also a very common sight in the Chinese entertainment industry. In Chinese TV sitcoms, which often feature tales from ancient China, communist heroes or modern business professionals, it is common for main characters to make use of idioms, which makes them appear smarter, more refined or in control of the situation. Idioms even have specific game shows devoted to them, in which participants have to guess the correct phrase based on a clue. Needless to say whosoever has spent the most time studying and memorizing the idioms will come out ahead. 井底之蛙（jǐng dǐ zhī wā） refers to the story of a “frog at the bottom of a well,” who believed that the well was the whole world, and that the speck of light above him was the sun. This idiom refers to people who are narrow minded or who discount things outside of their own experiences. While I initially learned some idioms and set phrases over the course of my Chinese studies in college, I only really started using them after moving to China for work. While working in China, I started to notice that idioms were employed in professional environments, mainly by managers, executives and experts. I also observed that correctly employing idioms and set phrases in conversations with native Chinese speakers almost always led to a very surprised reaction, even more so than when using a colloquial Chinese phrase or greeting. The correct use of idioms and set phrases in a conversation has almost always resulted in the Chinese speaker expressing their admiration and respect for a Westerner putting in the time to extensively study the Chinese culture and language. Since then, I have continued to study idioms and and set phrases, and have found them to be a very useful tool in my communications with Chinese managers and executives. For me, and I hope for you as well, these phrases have helped to bridge the cultural and language barriers between China and the West, and have allowed greater degrees of trust and cooperation to flourish between myself and Chinese colleagues. 三人成虎（sān rén chéng hǔ）, or “three people can turn into a tiger,” warns that a repeated rumor can become fact, or at least believed by the public at large. Here Are Some Idioms to Get You Started! I have provided a short list of idioms and set phrases below (in addition to the five links above), which I have personally found to be very useful and relatively easy to apply in conversations with the Chinese. The trick to effective idiom study and usage for non-native Chinese speakers is to choose and focus on a set number that you can see yourself using on a regular basis. After that, it’s a simple matter of practice and repetition.To start with, try combining idioms you like with simple phrases such as “this/that is,” “don’t,” “remember…,” and “we should…, ” etc. For those of you new to the Chinese language I would suggest first checking out this guide to Hanyu Pinyin and basic pronunciation. Good Luck! 前所未有 (qián suǒ wèi yǒu): unprecedented (e.g. of a situation). 不可思议 (bù kě sī yì): unimaginable or unfathomable. 骑虎难下 (qí hǔ nán xià): when one is riding a tiger it is hard to dismount. The idea behind this idiom is that when one is stuck in a difficult situation, all one can do is continue onwards and do one’s best. 讨价还价 (tǎo jià huán jià): to haggle over a price. 精益求精 (jīng yì qiú jīng): to improve something that is already outstanding. 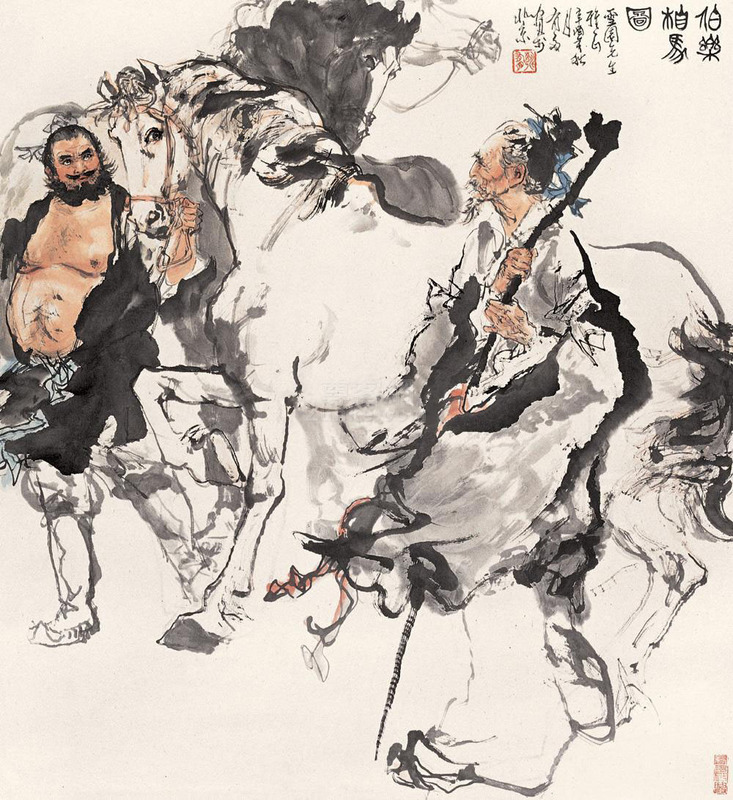 对牛弹琴 (duì niú tán qín): playing a lute to a cow. This saying describes talking to the wrong audience or to an unappreciative one. 功亏一篑 (gōng kuī yī kuì): failing for lack of a final bucketful. This saying refers to failing through the lack of a final effort. 实事求是 (shí shì qiú shì): to seek the truth from facts. This saying means to be practical and realistic. 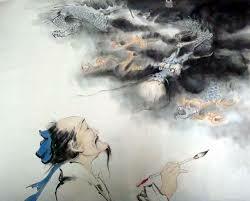 班门弄斧 (bān mén nòng fǔ): to play with one’s axe in front of the house of Lu Ban, the master carpenter. This saying refers to showiing off one’s slight skill in front of an expert. 好事多磨 (hǎo shì duō mó): good things do not come without toil, or the road to happiness is paved with hardships. 听天由命 (tīng tiān yóu mìng): to consign oneself to the will of heaven. 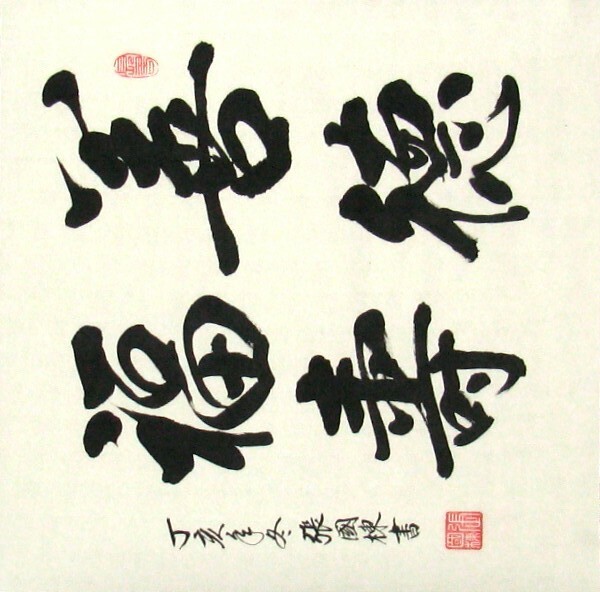 This saying means to resign oneself to fate or trust to luck. 情不自禁 (qíng bù zì jīn): unable to restrain ones emotions; cannot help oneself. 半途而废 (bàn tú ér fèi): to give up halfway or leave something unfinished. 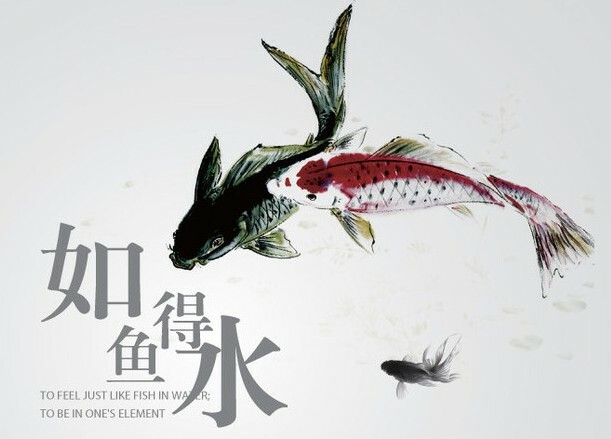 Click for more great pictures based on Chinese idioms. 万事俱备，只欠东风 （wàn shì jù bèi, zhǐ qiàn dōng fēng）: everything has been prepared, and all that is needed is an easterly wind. This saying means to lack only one crucial (and final) item. 读万卷书，行万里路 (dú wàn juǎn shū, xíng wàn lǐ lù): to read 10,000 books and walk 10,000 miles. This saying extolls the virtues of both knowledge and experience. 天外有天，人上有人 (tiān wài yǒu tiān, rén shàng yǒu rén): there is a heaven outside of heaven and a person above a person. This saying reminds us that there will always be someone better or more skilled. 不经一事，不长一智 (bù jīng yī shì, bù zhǎng yī zhì): wisdom only comes through experience. 兵马未动，粮草先行 (bīng mǎ wèi dòng, liáng cǎo xiān xíng): before the troops get under way all the supplies must be prepared. This saying extolls the importance of being prepared ahead of time. 千军易得，一将难求 (qiān jūn yì dé, yī jiàng nán qiú): while it is easy to raise an army of 1,000, a competent general is hard to come by. This saying means that it is hard to find a good leader. 单丝不成线，独木不成林 (dān sī bù chéng xiàn, dú mù bù chéng lín): a single thread cannot become a cord, and a single tree does not make a forest. This saying extolls the necessity of cooperation or being part of a greater whole. Do you have any questions or comments on using Chinese idioms to communicate with the Chinese? Do you have any experience you can share on using idioms in Chinese companies, or on what idioms are most effective for communicating with Chinese executives? Please feel free to post your thoughts in the comments section below. Brilliant topic and useful comments, many thanks! Hi Lori, glad you enjoyed the article. Thanks also for sharing additional idioms – to me they are all like extra little bits of Chinese culture, and each new one you learn brings you that much closer to Chinese culture and the Chinese people. One thing I’ve found as my Chinese reading level increased, is that idioms and set phrases began to appear with increasing frequency (e.g. in newspapers, mags, online content, and standardized tests). While the ones seen everyday will not usually be as out-there as “when riding a tiger it is hard to dismount,” there are the of the variety that must be learned and remembered. So anyone who aspires to read magazines and newspapers in Chinese would do well to make a start on idioms and set phrases. Thanks John, I’m glad the article was useful to you. Also, thanks very much for providing a great idiom – I’ve never heard that one before! Another great post from your hand, Sean! Thank you very much! I always look forward to reading your posts and each and every time I learn a lot. Thanks for commenting Holger. In the future if you ever have any specific questions on China, Chinese culture, Chinese language or business in China, feel free to send them my way. I may be able to address them in a future article. My personal favourite is 画龙点睛 (huà lóng diǎn jīng)–literally “draw/paint dragon dot eye.” You have a great picture of it above. “To bring to over-the-top awesomeness something that is already really good” is the meaning I take from it. No very good equivalent in English. “Icing on the cake” doesn’t do it justice in my opinion. And you’re right, they do reveal a cultural mindset. The stories behind many of the chengyu are fascinating, and some are a little like Aesop fables. Do you think so too? I also enjoy the stories behind the idioms (I have a few books that simply introduce idioms and tell the stories behind them). Though for the most part I focus on the modern meanings and how they are used currently. Apparently, meanings and usage can shift over hundreds of years. Thanks Ramona. If you come across any other useful idioms feel free to let me know. Maybe they could be used in a follow up post.